Mansa Musa was a very rich king. He was said to have taken more than 500 people with him on the hajj, each carrying a staff of solid gold. When Mansa Musa passed through the Egyptian city of Cairo, legends say he gave away so much gold that the price of gold fell, and the economy was affected for more than twenty years. The appearance of a wealthy king from a faraway land made a deep impression on the people he encountered, causing Mali to appear on maps throughout the Middle East and Europe. For the first time, sub-Saharan Africa became well-known north of the great desert, as well. 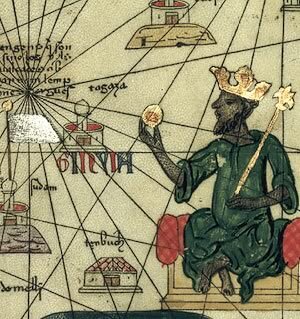 Mansa Musa was the richest person in History according to a calculation by the website Celebrity Net Worth. After adjusting for inflation, Musa was worth $400 billion. Forbes magazine estimates that the richest man in America, Microsoft founder Bill Gates, is has accumulated only a small fraction of the wealth of the ancient African king. Click here for Forbes’ estimated current of the software entrepreneur. The approximate borders of Ancient Mali at its greatest extent.